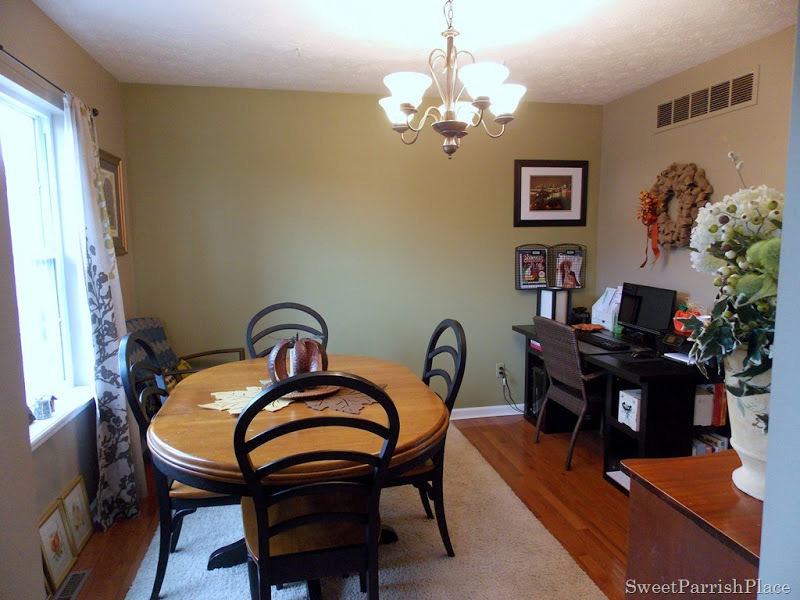 It’s week one of the $100 Room Challenge and I am planning a dining room/office refresh! Hey friends! 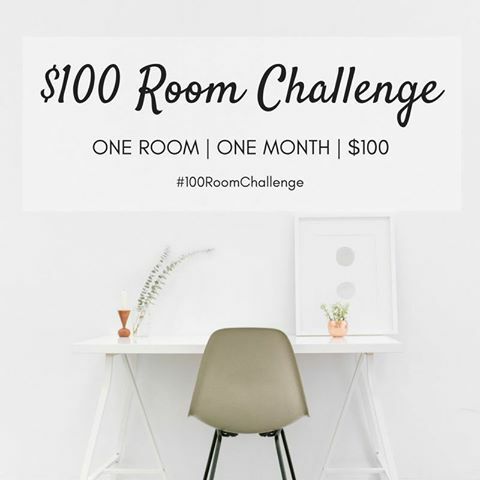 I am so excited for today because I have decided to join the $100 Room Challenge for the second time and this time I will be doing a dining room/office refresh on a $100 budget. And I will be sharing it all with you each Wednesday, with the final reveal happening at the end of this month! 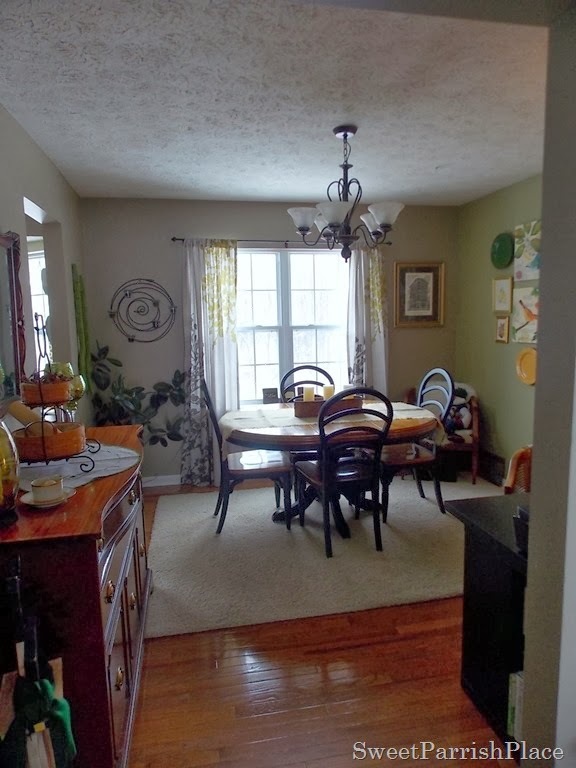 So as I mentioned above, I am planning to do a refresh on my dining room for this challenge, and I am hoping to give this room a new look and feel. Today, I want to share some before photos of the space, and then I am going to give you an idea of what I have in mind to refresh this space. For those of you who don’t know, my dining room/office is a shared space. 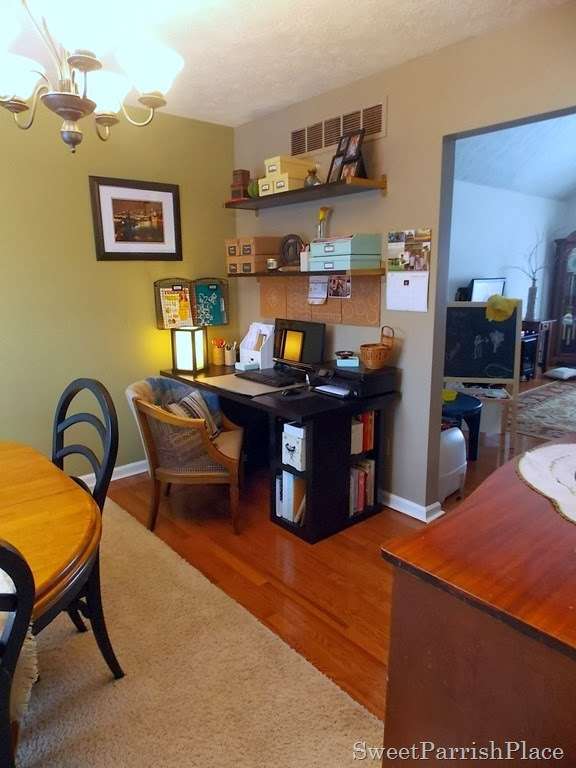 It is not ideal, but we don’t really have any other space for a home office in this home, so we are making the best of the situation. Let’s take a look at where I started with this room, and where we are with it today. 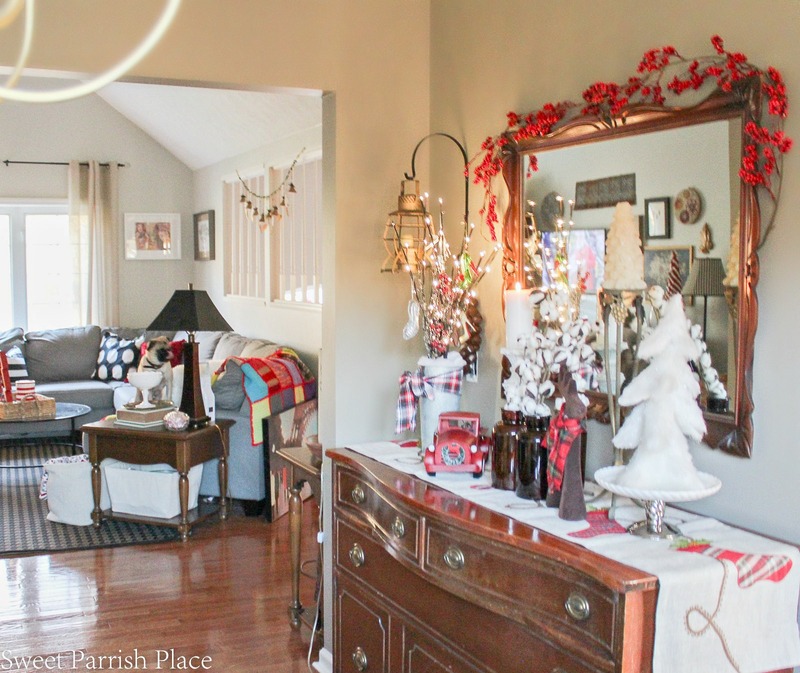 The photo above at the top of this post is the most recent depiction of the space and this photo is from my Christmas dining room tour I did in December. This is the room before we moved in. All of the furniture and belongings pictured above belonged to the previous owner. This is what the room looked like shortly after we moved in. Please excuse the quality of the photos. This was pre-blogging days! We basically plopped in the table from our old home and we did purchase the desk for the space from Ikea. I painted the room about 6-7 months after we moved in, and I was never in love with the results. But I didn’t have the time or energy to repaint it, especially when we had so many other things to be done in this home. I kind of vowed not to repaint any room until every room had been painted at least once. And I am happy to say that every room has been painted in this house except the family room downstairs, which we have no plans to change. This is what the room looked like after I painted it. 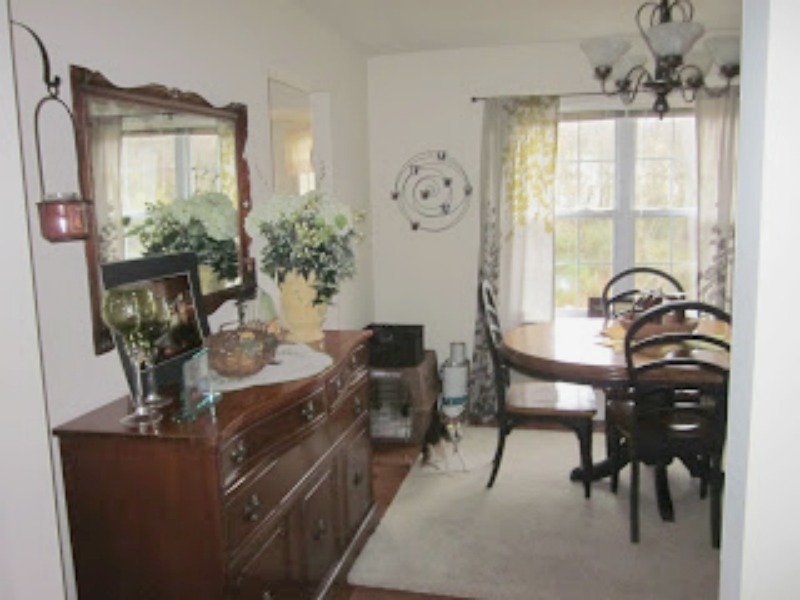 I do want to mention when you are viewing these photos, keep in mind that these are photos I am using that were taken during various seasons and stages this dining room has went through to get where it actually is today. 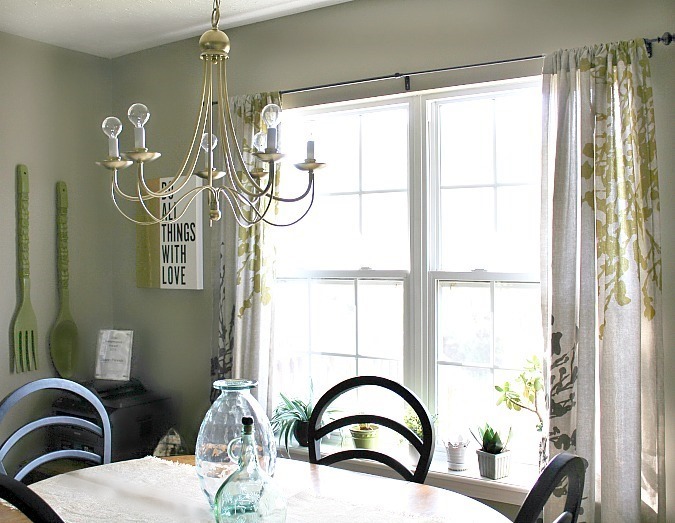 So I decided to update the dining room for this challenge because I really want to lighten up this room and give it a much more neutral backdrop. Especially because I would love to take more blog photos in this room, but I always hate it because one of the walls is green and it photographs horribly. I really want this room to be a good place to take photographs for multiple things I do on the blog. At this point, I was using a cream colored shag rug that I had from our previous home. I used it because it was basically all I had and it was not in the budget to get a new rug at the time. I had painted the room back in 2012, you can read that post here, and it was in the very early stages of blogging for me. 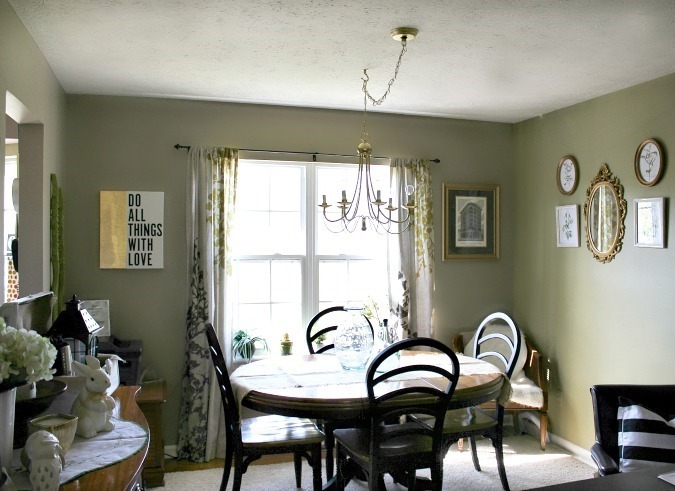 The three brown walls are a Behr color called garden wall, and the green accent wall is another Behr color called oolong tea. Honestly, it has been five years since I chose these colors and this accent wall, and what was I thinking? I am so ready to lighten up this room you guys! The next change we made to the dining room/office space was to add these shelves over the desk. The buffet you see in the space is something I have owned for like 25 years, and it won’t be going anywhere. I do have plans to paint this piece, but I’m not sure if I will have time to make that happen for this challenge, but we shall see. Ideally I will make it over, but there are some other things that will take priority over this, like painting the walls. In the photo above, you can see that we had removed the cream area rug and were going with bare floors for a while. Our dog, who has since passed away, had completely ruined that rug by peeing on it so many times, so after she passed, we threw it out and it took a little while before I replaced it. You can also see in the above photo that I had brought in a couple of thrift store file cabinets that I made over for this space. It added storage to the office part of the room that was desperately needed. These will stay in the room but may get another little update. 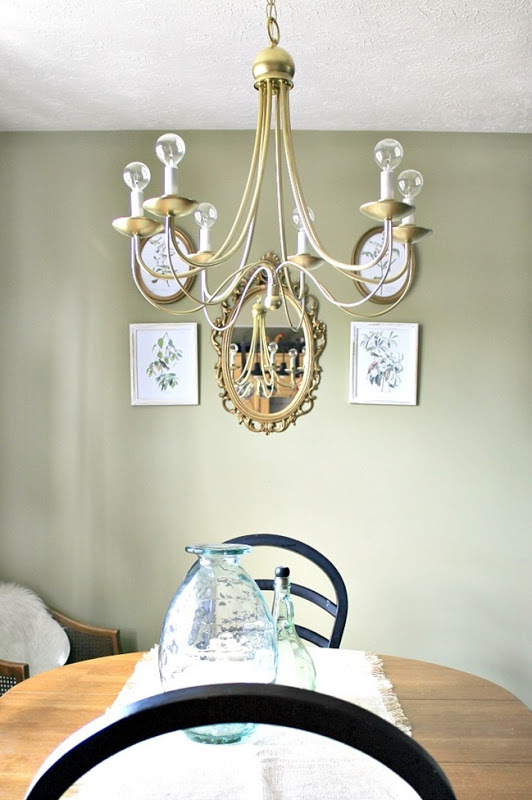 A couple of years ago, we replaced the chandelier in the room with a $5 yard sale chandelier that I made over. We also moved the light so that it was centered over the table. since we are using this space as both an office and dining room, our dining table is not in the center of the room like it would normally be, so we just swagged it over to be centered over our table with a ceiling hook. I did not want this to be permanently moved because eventually the table may be back in the center of the room. We did purchase a new rug eventually, and this will also stay in the room because I still like it a lot. You can see another view of the rug in the very first photo in this post. We have had this rug for over a year and I have never actually written a blog post about just the rug! So, that is basically the journey of our dining room so far, and the photo above was taken just last month, so that is what the dining room looks like, except for one thing. We did replace the desk chair a few weeks ago, and this is what the new chair looks like. 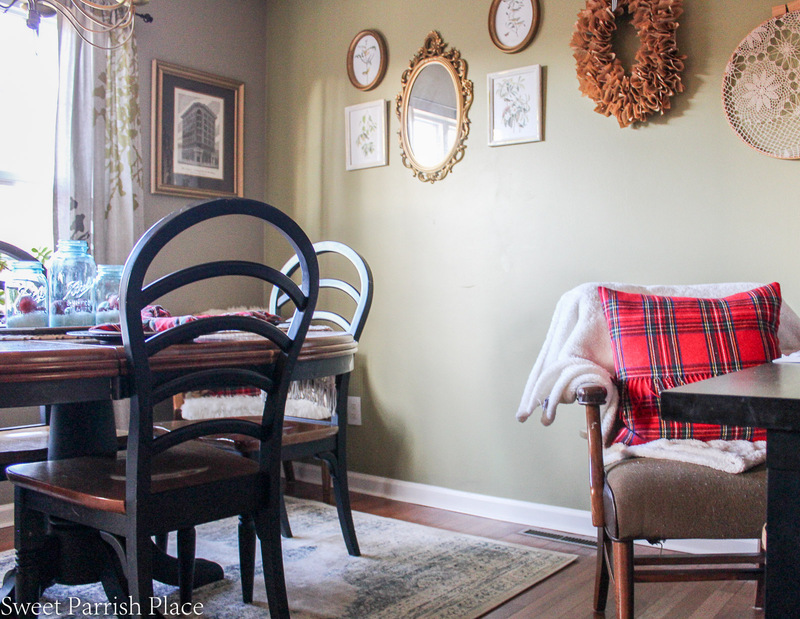 I shared this new chair during my Christmas dining room tour as well. The chair is so new that I almost feel like it should be included in my $100 budget for this space, but since I purchased it with a gift card I had, it never really came out of any budget of mine because I didn’t pay for it with our money. I do really love this chair and it is a huge improvement. It is the first time we have ever purchased a brand new chair for this desk area. Before that, we had various thrift store chairs in the space. 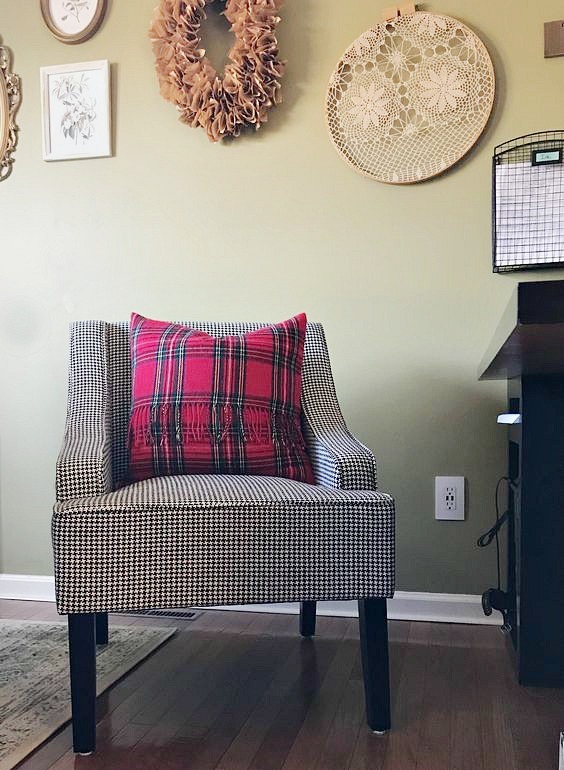 Now that you have seen where our dining room currently is, I want to share some of my plans for the dining room/office refresh. To be honest, I am kind of going with the flow with this room and my main goal is to paint the walls and make the space lighter and more neutral. So I plan to paint the room a lighter, more neutral color, and I am hoping to use some paint that I already have so that will be free. I am hoping that I have enough left over from when we painted our living room to paint our dining room, which is right next to the living room. Our living room is a Benjamin Moore paint color called Gray Owl. This is a photo I took standing in my dining room looking out into my living room with the Gray Owl color on the walls. Getting rid of the green accent wall is the thing I am the most ready to change. Do you ever look back at the things you used to like and wonder what on earth you were thinking? Yeah that is me with the green wall. I like the idea of the dining room/office and the living room being the same color, it will flow nicely. So the major change in the room will be the paint color on the walls. I will probably change the curtains as well to something completely different. I plan to purchase or make curtains that are longer, so the rod will be raised up higher over the window. 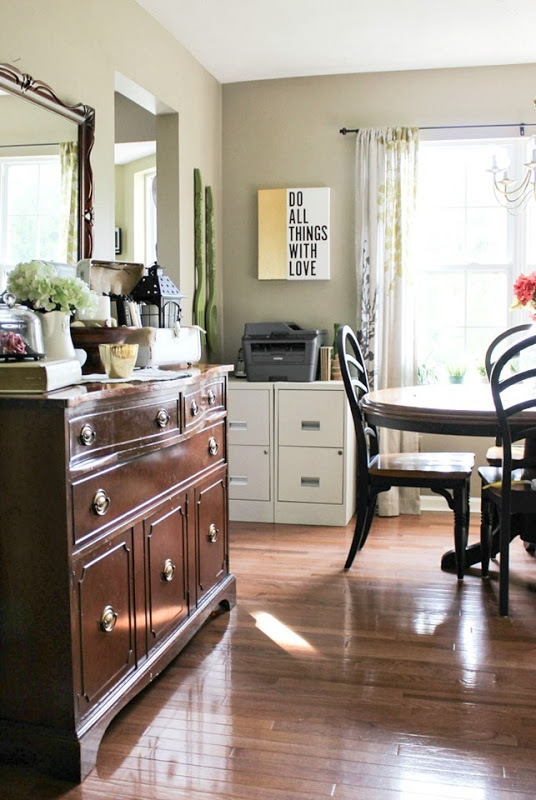 I would like to tweak the file cabinets I have in the room by adding some rustic looking wood over both of them to make them look more like a piece of furniture. I am currently tossing around the idea of possibly painting either the table and chairs, the desk and shelves, or the buffet. 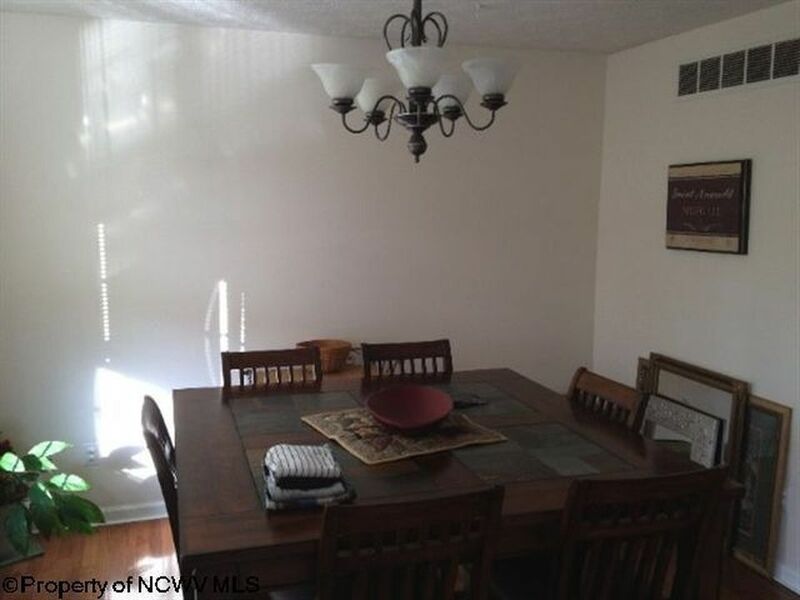 This dining room/office is a mish mash of furniture that are all in different styles, and there is not much I am going to be able to do with that within this budget. The table and chairs are from our previous home, and in a perfect world I would replace this table and chairs, but that is not going to happen right now. I would like to be able increase the seating around the table by bringing in a bench that will go behind the table and in front of the window, which will seat two people. Then I will be able to place two chairs on the other side of the table so we will be increasing the seating from 4 to 6. I am hoping to find something that I can use as a bench at a thrift store or on Craigslist. Here is a little vision board I made for the room. I would like to change out some of the storage boxes that are currently being used on the shelves over the desk. Some of them were made using old shoe boxes, and I would like to upgrade them, but we’ll see if that is in the budget or not. 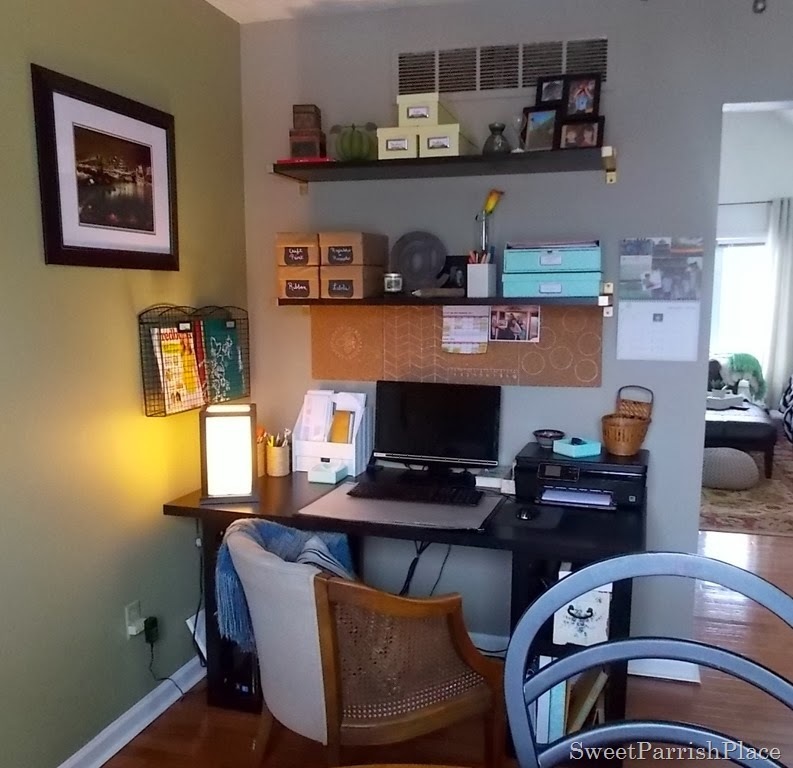 I also want to remove the bulletin board squares over the desk and find some other type of solution to be able to hang things here over the desk area. I plan to shop my house and make some changes to the wall decor and other decor in the room using things I already have. I am working on a 4 week time frame for this makeover, so I am not sure exactly how much time I will have. So which pieces of furniture I paint will be based solely on how much time I have. The reveal of this room will happen in exactly 4 weeks from today! 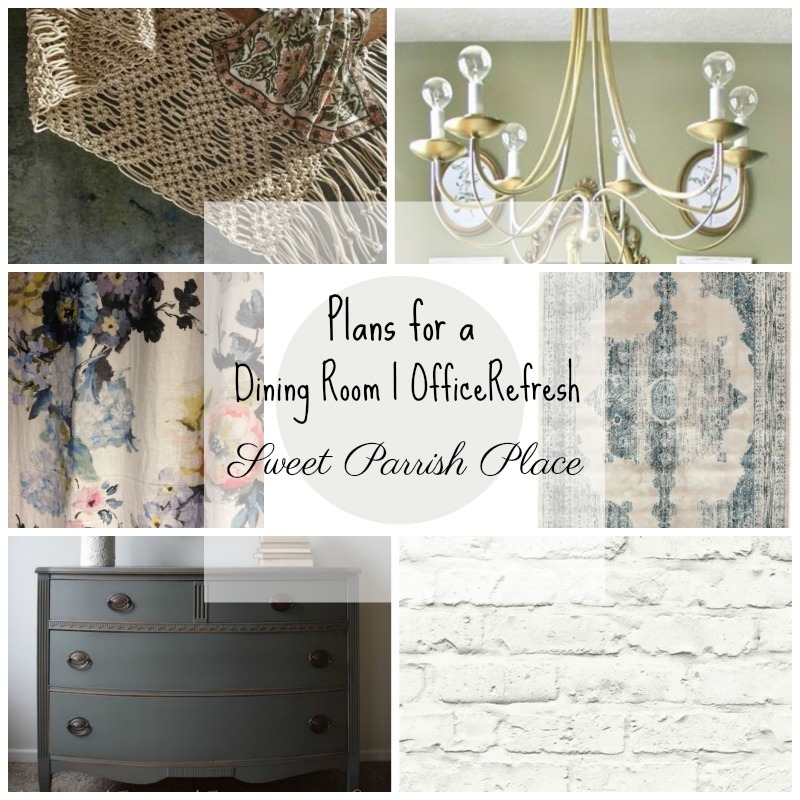 I sure do hope you will stick with me through this challenge and find out how this dining room/office refresh turns out! I hope to be able to really change the look and feel of this space and still keep within my $100 budget and my 4 week timeframe. Wish me luck! 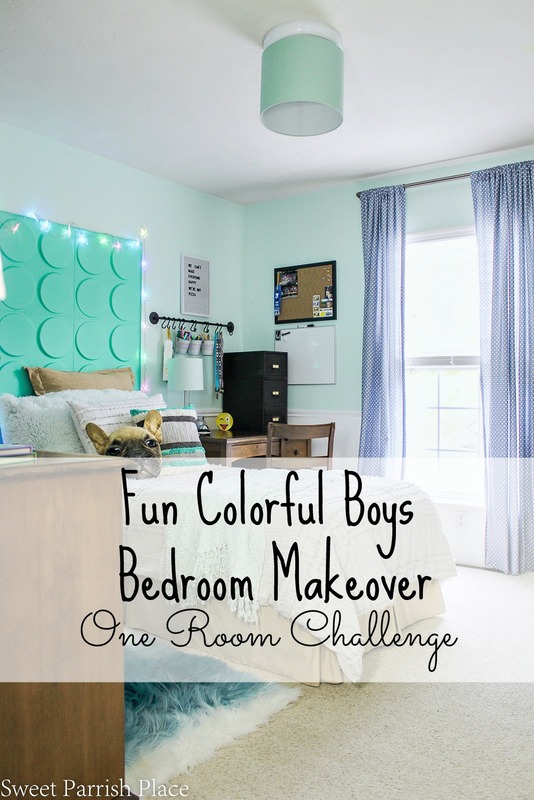 Now, go and check out some of the other bloggers who will also be participating in the $100 Room Challenge. I can’t wait to check them out myself! We always have similar projects at the same time. 🙂 I can’t wait to see how you update your space. Well that certainly must be because great minds think alike, right? Happy New year! I can’t wait to see what you do in here! I’m already in love with your rug and buffet. And I have Gray Owl in my living/dining rooms and I love it. It’s going to look amazing! Thanks so much Meredith! I’m excited for the change! 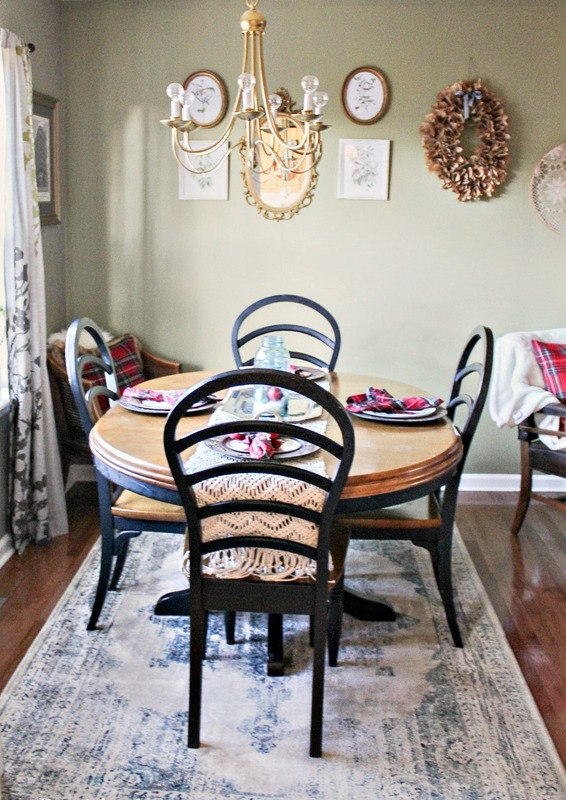 Oh, I love a dining room makeover! Can’t wait to see what you do with this space! I can’t wait to see what you do in here. 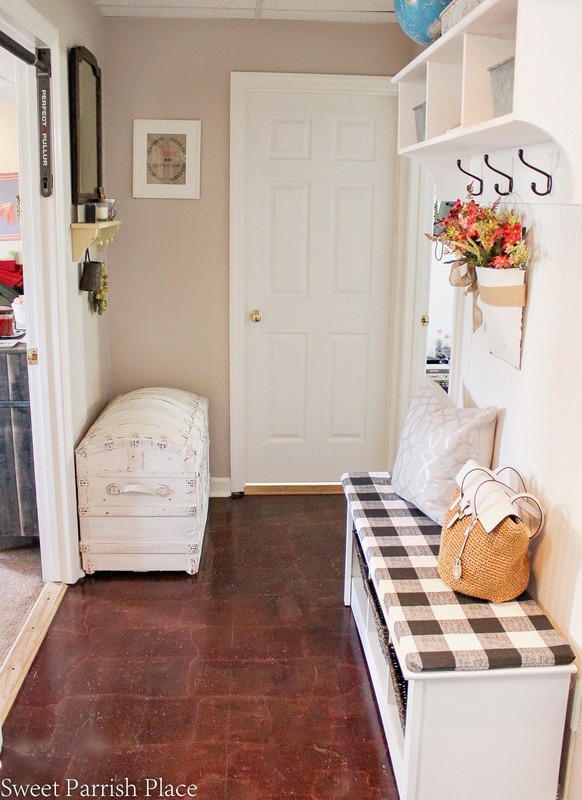 I loved your mudroom makeover! Ahh Liz, I am so happy you liked my mudroom makeover! Thanks so much! I love your mood board! Your new chair is gorgeous!! Thanks Tracey, we really like it! 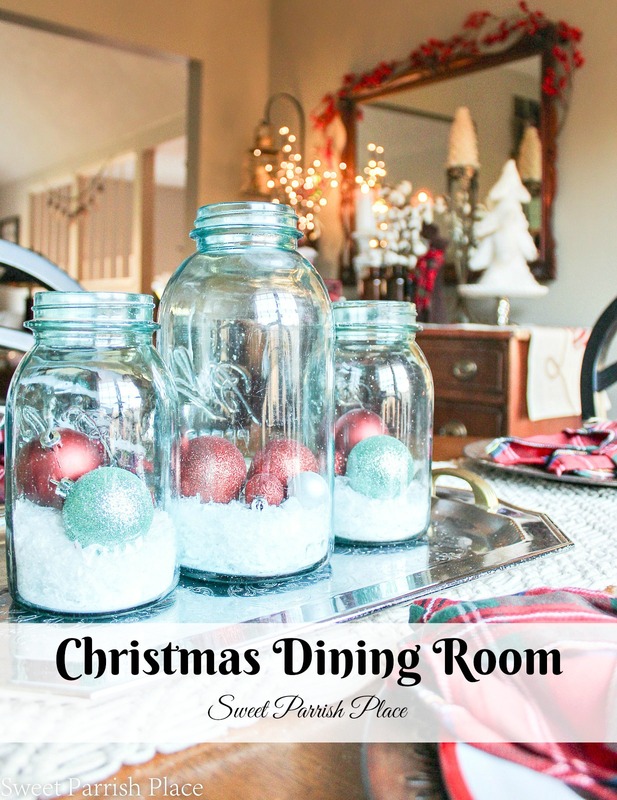 Your dining room is already so cute but I do love your ideas for change. That rug is so pretty and I love your buffet too. I think gray walls would look stunning. Another great makeover to look forward to. Aww thanks Patti! There are things I like about the room and things I’m sick of. It was one of the first rooms we painted and I never did like the color, but we were under time constraints and it was too late to change it. I love your ideas for your dining room. I can’t wait to see it all come together! Thanks so much Jenny! I am making good progress so far. What a great space! Can’t wait to see new paint on the walls… that’s always a game-changer! Happy to have you joining the challenge again! Thanks Erin! I’m excited to participate for the second time! I can’t wait to see what you come up with Frenier! 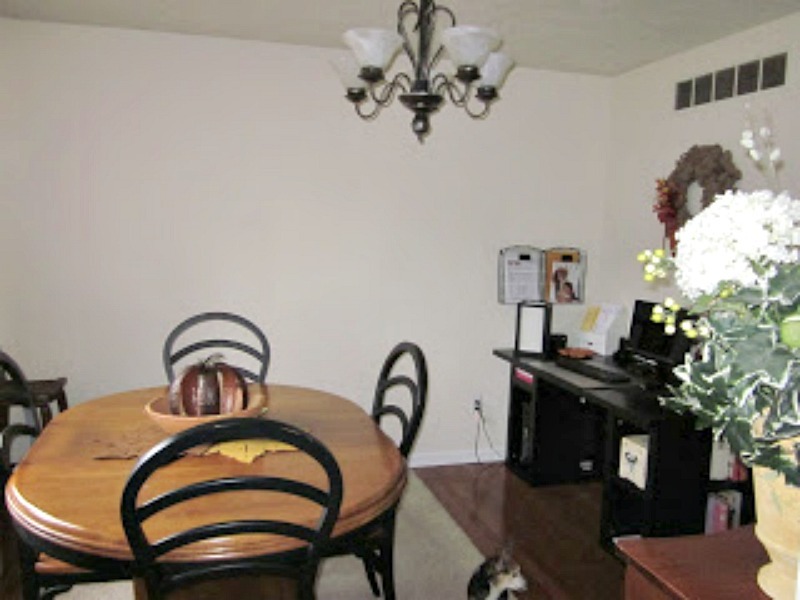 I love the dining room makeover! Hello Nicki, I love your ideas for your dining room. I can’t wait to see it and try at our home. Thanks and keep sharing. Oh thank you so much Alyssa! I am very happy with the way the room is progressing so far! Hi Nicki, Did you make the red plaid pillow in your new office chair? I love it. Hi Mary! No, I did not make it. I bought it at Marshall’s or someplace like that a couple of years ago, and have not found it anywhere online to link back to it. It’s really cute though!